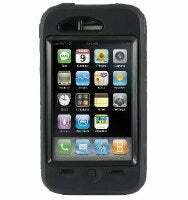 OtterBox has announced release of the Defender series case for the iPhone 3G. The new case costs $49.95. The OtterBox Defender encases your iPhone 3G is three layers of protection. The OtterBox Defender features three layers of protection: a polycarbonate membrane that keeps the iPhone from getting scratched or dirty, a high-impact polycarb shell, and a silicone skin that helps to absorb impact and also gives the case a tactile feel. The Defender for iPhone 3G allows access to the iPhone’s silence switch, and also provides an improved screen and better fit and feel, according to the company. The dock connector, volume buttons, camera and headphone jack, as well as the sleep/wake button, all remain accessible. Acoustical vents have been incorporated to allow clear sound to pass between the microphone and speakers. The case includes a holster-style swivel belt clip which converts into a display stand when the iPhone is placed facing screen-out. The OtterBox Defender is available now in black, and is coming soon in white, black and yellow, and pink.